It was only 5 years ago that I bought my first Apple product – a 5th Generation iPod Classic. Following that was a white Macbook in 2007: inspired by Leo Laporte’s TWIT network I decided to give podcasting a try, and looking at available options it seemed that Garageband was the way to go. I enjoyed using that MacBook so much that when the iPhone came out in the UK and Japan I was desperate to get my hands on one, and within three hours of landing back in Japan in late 2008 I was in the Softbank Store, signing up for a 2 year contract. Well that was it. I was hooked. Since then I’ve upgraded every year, paying hefty cancellation fees on old contracts in order to have the latest and greatest. The improvements in the iPhone have enabled me to do more each year …and I’m excited to think of where it might take us in the next 5 years. Having an iPhone really has changed my life here in Tokyo. It means I can go anywhere without getting lost, I have all my data with me at all times, I’m potentially in touch with thousands of friends and family members around the world at all times, and I have access to any information I might need to do what I need to do. Whilst I’m sure this would make a big difference back home in the UK, here in Japan it’s like a lifeline (even more so now it can warn me when an earthquake is about to hit). Oh, it also means I can broadcast marathons, and paint pretty pictures on the roads with GPS. 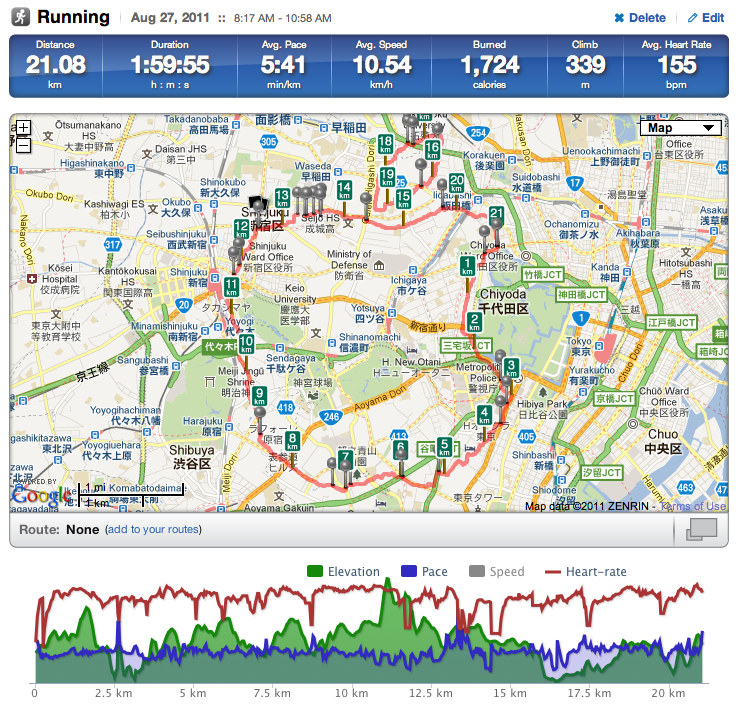 This morning’s run, which spanned central Tokyo, took me first down the western side of the Imperial Palace, across to Roppongi, through Omotesando, then up to Shinjuku. The leaf is in Kagurazaka, and the start/finish point just by the entrance to Yasukuni Shrine. All stats and interactive map on Runkeeper. 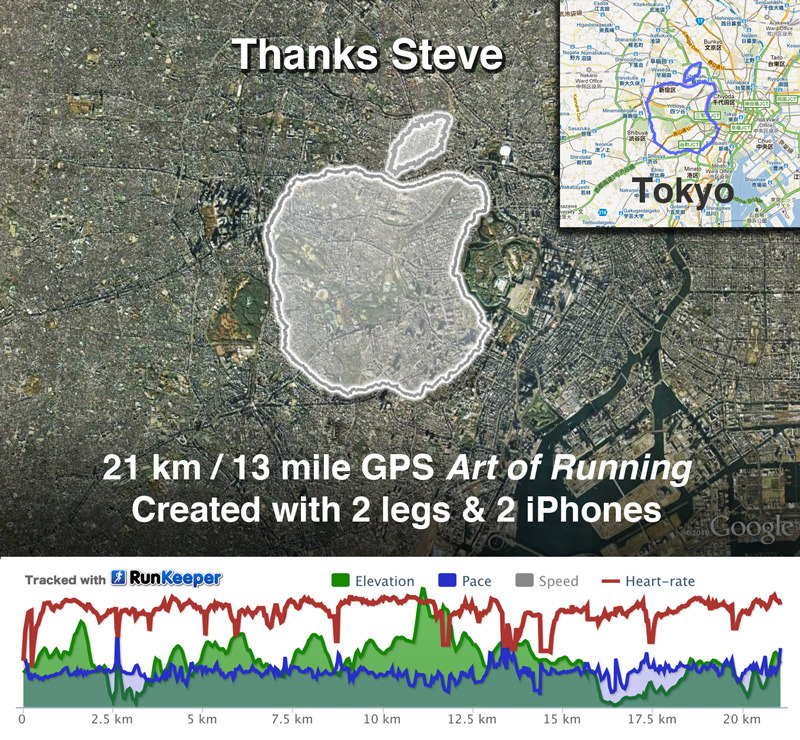 For other GPS art, including my Google+ logo, check out The Art Of Running. Keep in touch with my tech exploits via Google+ or Twitter. I was deeply saddened to hear of the passing of Steve Jobs this morning. Little did I know when I created this tribute to Steve that only a few weeks later, he would no longer be with us. Steve’s vision and passion has had a deep impact upon my life, and I shall be forever grateful for all that he gave to us. Your Apple is beautiful! Nice work! I like this, it’s beautiful. I mean, it’s appropriate way to show his appreciation. After all, he can do his running art because of iPhone. Does Runkeeper not work on non-iphones? I have Runkeeper on my Droid. And there are other apps that will do the same thing. Hell, I could use a basic GPS unit to keep a log of my run/walk/drive/etc. and then upload that somewhere. I have a /etc folder, but nowhere can I find run/walk/drive/etc! Please help me out – I know I must have lots of data and I’d love to upload that somewhere. WoW! Now thats a Tribute! Oh my, how does navigation work on my phone then? And the first as well. I try to avoid doing so if possible! During this run I needed to run through a school yard – but the school was closed so I paused the app, ran around to the other side, and then restarted – there’s a small hole in that section of the Apple. Doing funds like this does mean you get to explore whole new areas of cities etc, places you’d never normally visit. nice! i like it! it’s a difficult thing to do in Tokyo! BUT, you could do all that stuff you mention with an Android phone that costs a third of the money. ….that wouldn’t have existed if Apple hadn’t created the iPhone. Yes it would have. Android, inc. was founded in 2003 and Google bought them in 2005. You missed the point. Yes, you could have been creative using an Android phone. But, you weren’t. It didn’t inspire you. Now that a person with imagination shown you what is possible with this creative tribute, please feel free to do the Google/Microsoft thing: copy the idea and then claim some superficial superiority. You mean just like Apple did with the iPad. Because Apple “invented the tablet”, tablets have been around for a while. Or What about Spaces in Mac OS X, that was a Linux, Solaris, AIX and BeOS thing long before Apple stole it. Everyone copies everyone! Apple included. Now if anyone else would like to take part in an Apple vs Google/MIcrosoft/Linux debate may I suggest they go play over on one of the tech blogs – there’s people there who love to get their knickers in a twist over this kind of thing. My server is allergic to conflict and I don’t want to have to plug in the intravenous again like I had to do when I posted that photo of Bill Gates using an iPhone. Believe it or not, the 16GB iPhone is the cheapest smartphone to own in Japan thanks to favorable wireless plans from Softbank. Situation may be different in other countries. Yes, maybe you can do all that with one of those cheap plastic phones that runs on android…but if you are gonna do something..better do it with STYLE. Not much of an Appl’ophile but I can appreciate your devotion. Good going, Joseph. Not much of an Appl’ophile myself but I can appreciate your devotion. Good going, Joseph. Wow! You do like Apple :-). I can’t live without my iPhone… Oh, and Runkeeper is a bit of a god send. Keep doing the fun stuff. The only way it could be better is if it were run in New York, the so-called “big apple”. Impressive. I always look forward to seeing my map after I run somewhere new. Great job. you sound like a typical apple tool to me you should kill yourself and do the world a favor before you pollute the gene pool! Good job. I bought an Apple ][ in 1979. It was the start of my career. I eventually became a CIO and the rest is history. Steve literally changed my life. You rock, Steve. And thank you. Nice to hear from you Giles, been a while! I didn’t know of Richard’s work – looking at his work online I’m reminded of Andy Goldsworthy of whom I’m a big fan. I’m not sure that the Tokyo Metropolitan Government Office would appreciate me leaving stones all down the streets though. Well done Joseph, your work is very creative and it’s really great to see you so inspired. Keep at it! How about you show your appreciation to someone who actually did something to improve your life in tangible ways? Rather than some guy who actually sells stuff for a living, and takes advantage of not only his hapless legion of followers, but untold numbers of third world workers? I’m not saying you should care about them, I don’t, but stop pretending Stevo is doing stuff to be nice. Magnus, thanks for your comment, much appreciated, although I think you are mistaking this site for one where negative comments which interpret articles in ways in which they were not intended to be interpreted are the norm. Have you tried Japan Today? I show my appreciation to many people on a daily basis. Showing my appreciation to Steve is not exclusive. I appreciate that of course you couldn’t possibly know this as you don’t know me, and you probably believe that all I ever do is draw GPS Apples. Also, I don’t think I claimed that GPS drawing started with iPhones. I just mentioned that having one has enabled me to do this. Just as having a Garmin or Android would also have done so. Now that’s what I call a tribute. Yes, I do plan the route in advance – it really wouldn’t be possible to do without proper prep. You can only run where the roads will take you – and sometimes they don’t go where you want them to go! not a prob! hope you didn’t mind! As its good to have motivation from other runners!! Keep up the good work! Ill going to look into planning my own art route thanks to your blog! May be not as long! my legs not ready for that distance yet! Awesome run there, though I don’t like Apple as a tech company as much as a marketing behemoth they are. That’s fantastic, what a great collection! Peace everyone — great idea. iPhone or Android they are tools and this was one creative use of the iPhone as a tool. Great tribute. Hey dude, Congrats for this, Im sure Mr Jobs will love it. My first Apple product was an Ipod 5th generation too..then came an Imac 27″, a MacbookPro, an Iphone (with NO contract so dont have to be attached to any company..), and an Ipod touch 64 gb..I love . Good Idea ! Thx Steve and keep on running ! Marcos, that’s fabulous! Looks great! I was wanting to do a Droid too but have been having problems finding a suitable place in Tokyo. Hi Ale, thanks for letting me know! Do you have a photo of it? Would be interested to see it! Fantastic! But isn’t the rig a bit big? Thanks to you, me and a couple of friends were inspired to do our own GPS running art at Stanford University.